It’s coming to the close of the academic year. Assignments are building up and exams are looming. Daily stints in the library are starting to feel like sentences to Alcatraz and you’re convinced your eyes are turning square from staring at your laptop all day. You have yourself convinced you haven’t a moment to spare for down time given the amount of work you have to get through. Yet, you still manage to squeeze in quality time with your social media accounts. We all do it. Unlock our smart phones and say to ourselves, “I’ll just check my Facebook really quickly”… which then becomes “I may as well check my Instagram while I’m at it”… “And my Snapchats… and my Twitter…” Next thing you know forty-five minutes have passed and you’re taking a BuzzFeed quiz to find out which Friends character you are. As a student, I often find my days consist of at least 4 out of 5 of the following activities – lectures, study, sleep, part-time job and social media. But the only two I am guaranteed to part take in every single day are sleep and social media. Social media is a massive part of society today and it’s highly unlikely that any of us ever go 24 hours without any sort of virtual interaction. But somewhere down the line “me time” and “social media time” merged and we’ve disregarded other activities as an alternative to “study time”. But in total honesty, “social media time” appears to have merged with all of our daily activities – snapchatting in class, checking Facebook while studying, and having a scroll through Instagram before you finally roll over and fall asleep at night. According to the American Psychological Association, millennials (those aged 18-33) have the highest levels of depression and anxiety of any other age grouping. As college students, we are constantly subjected to stress inducing situations i.e. exams, presentations and assignment deadlines. No doubt, having your head stuck in the books has a draining effect your mood. The solution? I find that if I can do something for at least one hour a day without having my phone in hand, I will generally go to bed feeling a lot more positive and refreshed. Here are 5 activities you can do to get you out of the books and off of your phone, so you can actually regain your “me time”. This is the oldest solution in the book, but without a doubt it’s the most effective! Studies have shown that exercise not only looks after you physically, but mentally too, releasing endorphins that make you feel good. I can’t rate hitting the gym high enough as a method of distraction and it’s an opportunity to release energy built up from sitting in front of a book or laptop all day. It will also keep your hands busy so you’re not tempted to reach for your phone! And if you stick with it long enough, you will not only start feeling better, but looking great as well. Win/win. Yep. Revert back to your childhood ways and creatively distract yourself for an hour. It sounds a bit ridiculous, but adult colouring books are on the rise for their therapeutic benefits. MedicalDaily.com describes how deep the healing power of art runs and colouring books provide an outlet for adults to be creative without having to think too much about it. 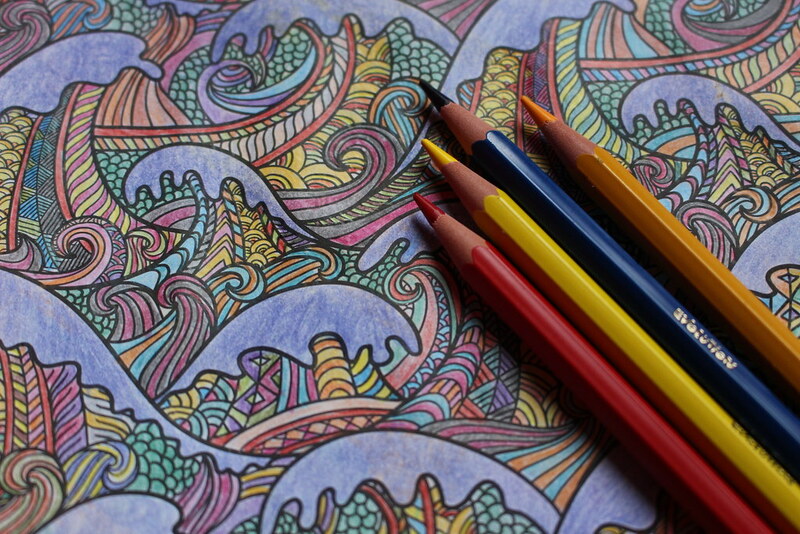 So don’t underestimate the stress relief a few colouring pencils and your favourite Spotify playlist can bring. Without your phone please! As unimaginable as it may seem, it is possible to meet your friend in Starbucks without taking a snapchat of your ‘venti Iced Skinny Hazelnut Macchiato, Sugar-Free Syrup, Extra Shot, Light Ice, No Whip’ coffee. Mental Health Ireland consistently emphasises the benefits of talking to someone for a stressed head. We all need an opportunity to vent. But it is less than possible to hold a quality conversation when someone scrolling through their timeline instead of looking you in the eye. So go out, meet a friend, have a chat and skip out on your insta-opportunity. Likes are NOT life. This one is a little bit of a contradiction because in most cases you will have to be online to access the decent documentaries BUT the enticing quality of documentary films is that they require next to all of your attention in order for you to follow what’s going on. Therefore leaving your phone elsewhere and submerging yourself in a documentary is a great way to spend your “me time”. Netflix is full to the brim with brilliant documentaries, most of which will have you forgetting to even check your notifications once you get stuck into them. There’s a lot to be said for curling up in bed with a cup of tea and having your mind blown by potential conspiracy theories, true crime stories or an acclaimed biography.